Within Chiyoda, we believe that safety is all about protecting our People, Environment, Assets and Reputation. Not only for this generation but also for future generations. Through strong Safety Leadership, worker engagement and a one team approach, we live up to our policies, not only to ensure compliance with Country legislation, Client requirements, International Standards & Industry Good Practices but also our moral obligations to our people and the environment are addressed. 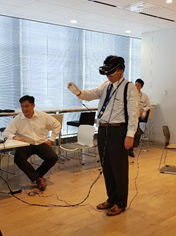 Chiyoda’s Safety Culture within its corporate and affiliated offices is nurtured through continuous communications and consultations, training (including the use of Virtual Reality simulators), Conventions, Safety Briefs and Safety Talks, just to mention a few.